Maputaland Lodge - Kosi Bay Accommodation. Maputaland Lodge offers luxury self catering as well as bed and breakfast accommodation. Situated close to the Kosi Bay lake systems as well as the Ponta Do Ora border post, it is an ideal location to enjoy a holiday to remember. Our chalets are fully equipped, serviced daily, with air-conditioning, and TV/selected DSTV channels. All guests can be assured of a comfortable and relaxing stay. For those who want to break away from the day to day routine, we can offer scrumptious meals at our restaurant. Or join us at our fully licensed bar for a sun-downer and soak up the African sun next to our sparkling pool. 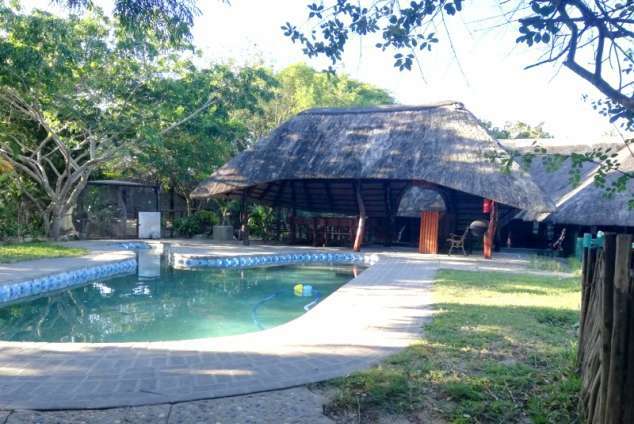 At Maputaland Lodge we can guarantee quality and excellent service and great memorable holidays. Bar/ restaurant with swimming pool and braai area. 1. A fax and photocopy machine. 3. Laundry service on demand. Lake Sibaya is the largest fresh water lake in South Africa with a surface area of 77 km² and an average depth of 13m. The lake was previously connected to the sea and with the closure of the estuary, numerous invertebrates and vertebrates were trapped in a fresh water environment. The Kosi Bay estuary system consists of a series of interconnecting channels and four lakes that flow into the sandy estuary mouth before reaching the Indian Ocean. This subtropical paradise features spectacular wildlife, birds and plants, including interesting species of mangrove and palms. Hippo and crocodile occur in the higher reaches. Leatherback turtles come here to lay their eggs in nests on the beach. Birds to tick off include - Pels Fishing Owl and the endangered Palmnut Vulture. The sandy mouth offers great swimming and paddling for kids. Black Rock beach is situated on the Maputaland coast close to the lake chain system of Kosi Bay. The prominent rock formation on the point gives Black Rock its name. The beach itself is pristine and untouched and visitors often have the beach entirely to themselves. The snorkeling in the bay is fantastic with many species of fish to be seen. If you are into lying on the beach and tanning, Black Rock is ideal. For fishermen, the bay offers excellent sea fly fishing and rock and surf angling opportunities. In addition, the more adventurous can launch fishing skis and behind back line awaits some of the best shallow water game fishing along the coast. DIVING - Parque de Malongane offers 24 dive reefs, which range from idyllic 8m, to extreme deep blue 40m dives. The closest reef is only 300m offshore, whilst the distance to the furthest is about 7 Km’s. OCEAN SAFARIS - Join an Ocean Safari to observe the beautiful landscapes and to experience the power of the ocean. If you’re lucky the dolphins might even accompany you throughout the trip. FISHING - Fishing is a very popular activity at Parque de Malongane, and it is a spear fisherman’s dream destination. A cleaning area is provided in the dive camp for deep-sea fisherman with their own boats, they have excellent staff who are more than willing to help…unfortunately no bottom fishing is allowed. Ponta do Ouro is the southern most point on the Mozambican coast. The easiest entry is through Kosi Bay border post, and Ponta do Ouro is 15kms from the border. There are many dive sites and coral reefs. Ponta do Ouro is a tourist destination to please any person interested in scuba diving, deep sea fishing, snorkeling, swimming on white sand beaches. There is a place in Africa where the wild elephants still roam. The legendary Ivory Route where the great tuskers still tramp their ancient pathways through dense sand-forest and tall yellow grass. This is Tembe Elephant Park, a 300 square kilometre reserve between Zululand and Mozambique, home to Africa’s largest elephants as well as the smallest antelope, the Suni. The Big Five also find their home here - lion, leopard, black and white rhino and buffalo, as well as more than 340 bird species and a myriad of other animals and plants. It is a world of hot silence and white sand, where the busy modern world ceases to exist and only the rising and setting of the sun marks the passage of time. Established in 1895, Hluhluwe-Imfolozi Game Reserve is the oldest game park in Africa, and is the only under formal conservation in KwaZulu Natal where the Big 5 occur. Set in the heart of Zululand, the game reserve offers visitors activities - from self guided walks, auto-trails, game drives as well as picnic sites. Viewing hides overlook pans and waterholes enabling visitors to see animals at close range. 333 page views since 15 Nov, 2018. Last updated on 15 Nov, 2018.